SLA Podcast Recording, with Special Guest Laura Bruij Williams! 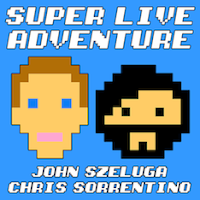 Join Chris Sorrentino and myself (John Szeluga) for a live recording of the Super Live Adventure Podcast this Tuesday, April 16th at Full Cup (388 Van Duzer Street, Staten Island, NY). Laura Bruij Williams of the Wahoo Skiffle Crazies will be joining the conversation! Doors open at 8 PM, and the show starts at 8:30. To hear previous episodes of the Super Live Adventure Podcast, look for us on iTunes and Stitcher. Listen to Episode 2 of the Super Live Adventure Podcast on iTunes and Stitcher!